As I’ve mentioned in the past, I often take tours when going to Motegi to watch the MotoGP races. When I go to F1, I usually do things on my own because the circuit is not that far from the nearest train station. It takes roughly 40 minutes to walk from the station to the track, but at Twin Ring Motegi, it is a considerably longer distance. In fact, there are no trains that go there and you are left with buses to get you to the track. The first time I went to Motegi it was under a Honda tour. I went on a day trip to Motegi and all I had to do was buy a ticket through them. The price of the ticket was included in the transportation and they provided me with just a few goodies. The following trips I had gone on the Yamaha tour. I had done both a day tour and an overnight tour. For the past two years I went on the Twin Ring Motegi tour that is operated by the circuit itself. It is a very different experience with both of these packages. Generally, a manufacturer tour is going to be better but the options that you have will be less. Honda used to have a decent tour but that has ended now. I am still perfectly happy taking the regular tours and most of the tours that are offered come in 2 flavours with 2 starting locations in Tokyo. The Yamaha tour is the most exciting tour I had ever taken. The format of the tour is pretty simple and it rarely changes much. The tour starts in the early morning with a bus ride out of Tokyo and into the circuit. One of the best things about taking the overnight tour is that you skip a lot problems with the traffic when you get to the track. Qualifying day at Motegi is usually pretty quiet and you get free run of the entire circuit, with the exception of the paddock. Leaving Tokyo is a little difficult as it is a Saturday morning but it isn’t terrible. It usually takes a couple hours to get to Motegi and it goes quickly as most of the time you are sleeping. On the Yamaha tour, they usually offer some goodies for you to keep you entertained on the long bus ride up to Motegi. 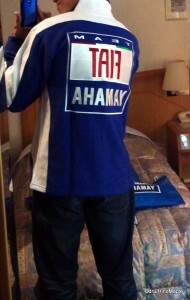 On the Yamaha tour, they used to give me a shirt and cap which was available at the circuit itself. The last time I went on their tour, I only got a flag and a cap, but the first year I went I had a flag, a cap, a shirt, and a towel. It has gotten worse and worse in terms of the goodies I get but with the downturn in the economy I can understand why. The tour itself usually has special goodies that we can get for being on the tour itself. Most of the time they play rock paper scissors to give away various items. They usually have enough items that most people get something. This has varied from posters to a very nice promotional book that highlights the previous year for Yamaha. I have most of the year books up until the time I changed to go on the Motegi tour but those books are some of my most cherished items from the tour itself. The Yamaha tour’s only drawback is that you have to sit with the Yamaha fans in the main grandstand. I don’t mind when the factory riders are riders that I like. When Valentino Rossi left the team in 2010, I couldn’t sit with the Yamaha team. It was going against my favourite rider. Now that he has returned to Yamaha this year, I am delighted that I can rejoin the Yamaha tour. If Rossi does retire, I am likely to keep going on the Yamaha tour as it is a favourite of mine. The Twin Ring Motegi tour is the exact same as the Yamaha tour with a couple of exceptions. The first one is the prizes and goodies that you get. The tour is very basic and since it is run by MobilityLand rather than Honda itself, there is little in the way of freebies. It is basically a charter bus system. This past MotoGP, they did have a small gift of a program, but unfortunately I lost the game of rock paper scissors. The potential savings was 1500 yen, the cost of the program itself. The tour guide is not very interesting either as he just informs us of any problems that are occurring. The timing of the tour itself is almost the same as the Yamaha tour and the only advantage of the tour is the ability to choose your own seats. I love sitting at the 90 degree corner grandstands as it is always very exciting. I can’t help but want to be there during the races but in all honesty, sitting in the main grandstands isn’t a problem either. I can easily get seats in the Yamaha section as it is never completely full and I have more space to stretch out. The 90 degree corner also has less food options available but in reality that is a secondary problem. In terms of functionality, the Twin Ring Motegi tour is not bad. The only downside is the hotel and that is nearly a deal breaker for me. The hotel I stayed in was the Utsunomiya Sunshine Hotel. It is a cheap and old hotel that looks and feels cheap. The rooms are standard, but very dark. There are barely any plugs to use and every room smells of smoke as the hotel was once an all smoking establishment. The quality of the room looks old and a little dangerous. I had 2 double beds, but one of them was a sofa so it was not comfortable to sleep on at all. It is okay to stay in but if I am booking a tour in the future, I would hope they’d upgrade the hotel a bit. The Yamaha tour goes to Mito rather than Utsunomiya. It is a little farther away, but just a little. Motegi is located right in the middle between Utsunomiya and Mito. Mito is a lot nicer as it isn’t as large and doesn’t feel like a sprawling city. 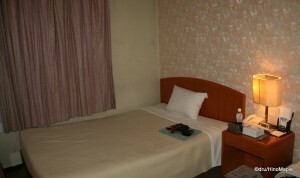 The Yamaha tour was kind enough to reserve the Toyoko Inn, which has good quality. When they have too many people, they get rooms in a hotel just down the street, which is actually a lot better. It is an old hotel but they refurbished it so that it doesn’t feel so crummy. Plus, I was able to get a free breakfast which can mean a lot. In Utsunomiya, there was no free breakfast. When getting a tour, the hotel can easily make or break the experience you have. While the Utsunomiya hotel didn’t break the experience, it certainly didn’t help at all. For 2013, the Yamaha tour changed their hotel to a hotel in Utsunomiya. I won’t know the quality of this hotel until I take the tour in October. The choice between the tours is an easy one for me. There are other tours such as the Ducati tour, Bridgestone, or even Honda. There are rider tours as well, but they are more limited. Most of them have their own websites with information about 2 months in advance of the MotoGP. Usually tickets for those tours go on sale a couple weeks before official tickets go on sale to a month after tickets go on sale. It is difficult to tell what will happen with the tours in the future as the economy is still not doing as well as it could. I suspect that the tours will continue indefinitely as long as the companies are still in MotoGP. Thankfully the remaining Japanese companies are still in it for the long haul so everything should be fine. 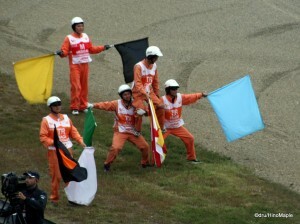 You can look forward to my future reports on MotoGP in Japan in the future. This entry was posted in Motorsports, Travel and tagged Ducati, Honda, japan, Mito, Motegi, Moto GP, MotoGP, swag, Tochigi, Tour, Twin Ring Motegi, Yamaha by Dru. Bookmark the permalink. Hmmm… I’ve only seen photos of your back. Kinda like photos of me too. 😉 I’m sure you’re referring to that?